McKinsey and Company released a research report last week titled “Building the web 2.0 enterprises” (free registration required). 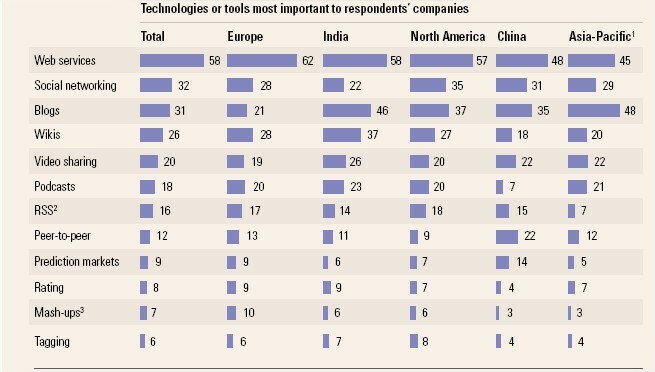 It is a global survey of about 2000 executives about the use, adoption, priorities and satisfaction with web 2.0 tools and technologies. 1. The technologies that are being implemented. Internal social networking: the goal of these tools is to help people stay in contact, share activities and be able to find expertise inside the organization. From the much discussed use of Facebook as an internal social network by Serena Software to the creation of SharePoint profiles, the tools that currently exist are very limited in their support and address only what Andy McAfee calls the Strong circle, the group of people you interact with on a regular basis anyway. A true internal social network that will spur interaction and discovery across the enterprise is yet to emerge. Internal Collaboration: it is not on the list but internal forums and collaborative tools for projects are one of the oldest and most used aspects of an active intranet. Many may associate these activities as part of a social network. External social network for customer or partners. In here as well, collaborative environment and Social Network seem to be used interchangeably. There are a lot of forums, discussions and member interaction but due to their limited scope, these communities rarely develop into a full fledged social network. The second point of interest here is the relatively low rating of some of the emerging trends like Tagging, Prediction markets and Mashups. We see a lot of interest in these upcoming technologies and expect to see them rise in priority in the future. 2. The cultural implications of adopting Web 2.0. It is good to see that in many organizations the change is not just in the tools that are introduced but also in the organizational culture and governance. The tight correlation between the level of satisfaction with web 2.0 tools and the degree the organization had changed indicates that they are tightly coupled. Introducing new tools to a rigid organization will result in failure. A successful implementation has to consider attitude and cultural changes as much as tools and technologies. 3. Who is leading the change: the role of IT. 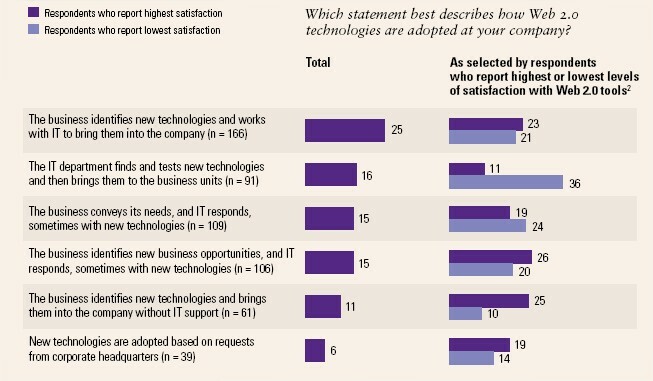 It is not surprising to see in the survey results that only in 16% of the responders indicated that IT had initiated the introduction of Web 2.0 tools. and that in the cases it did, they resulted in the lowest level of satisfaction. We’ve seen similar trends with our clients as these tools introduce chaos into the environment corporate IT is trying desperately to control and maintain. IT is responsible for keeping the security levels in place, ensuring availability, backup, searchability and integrating these services into the existing infrastructure. Since many of these tools are from open source or startup organizations, IT is justifiably playing the role of the gate keeper. A successful strategy must marry the business needs and opportunities with the prudence of a supported environment but in keeping with the agile approach that is inherent in web 2.0 – IT must be willing to give up some control otherwise web 2.0 initiatives will take too long to implement and will be too restrictive for an organization to embrace. In many cases, this is our role as strategy and technology consultants, to bridge the gap and set a cohesive strategy everyone can agree upon and execute. This content is the property of Edgewater Technology and is published as part of the edgewater technology blog. Any unauthorized use of this content is prohibited.